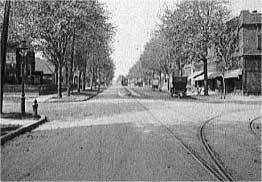 The merchants of Wyandotte Street are well satisfied with the appearance of the "White way" on that thoroughfare, and the tradespeople and residents of other streets are more than anxious to have the lights installed. They realize the benefits of the bright lights to business. One of the merchants on Wyandotte Street stated that his business had increased to a large extent since the "white way" was installed on that street. "We are always talking about our people shopping in Detroit", he remarked. "If we are to prevent this we must cater to them as the Detroit people are doing. If they want to go to theatres, build theatres here. In short, educate them to realize that they can get just as much pleasure at home as they can across the river. The "white way" on Wyandotte Street is proof that the people like the bright lights, and we must give them what they want," he declared in conclusion.